When people go on a diet or attempt to eat better, they often fail. Too many fad diets keep you from eating what you really want. The key is to eat healthier, but also to eat in moderation. It’s okay to snack or even eat small portions of your favorite foods. But you have to be eating a balanced diet and cutting out unhealthy foods like sugary drinks and fast food. The temptation to snack is often greatest in the afternoon and at night after dinner. After dinner, you can control what you eat and don’t eat by what you have available in the pantry. However, in the afternoon, you’re at work. It can be hard to eat healthy snacks at work all day in that environment. If you’re serious about minimizing temptation, read on to find out how you can take action. If your workplace has unhealthy snacks available all the time, you can do something about it. Healthy workplace snacks won’t just happen overnight.You will need to become a self-appointed spokesperson for healthier choices in the office. Offer to bake a low sugar dessert for the next employee birthday. See if other people want to join you in eating healthy during the day by having lunch together and sharing different healthy recipes. If you take initiative, you’ll see positive results both in your own health and your relationships with your co-workers. Snacks are great, just choose the healthier options. If your company is full of sick and overweight people, consider incorporating a formal wellness program into your office. Making healthy choices can be hard, but with the full support of a company-wide wellness program, it would get a lot easier. 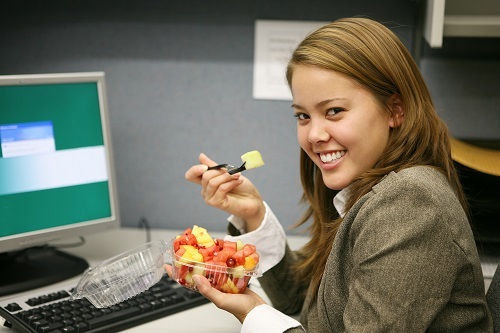 Healthy workplace snacks would just be the beginning! Wellworks For You can offer your company all the resources and service they need to start saving money on health insurance and enjoying all the benefits of a corporate wellness program.